Chairmain of Assonime (Association of the Italian joint stock companies), Innocenzo Cipolletta is Senior Advisor of UBS Italy Branch, Chairman of UBS Fiduciaria, Chairman of Fondo Italiano d’Investimento, Chairman of AIFI (Italian Private Equity, Venture Capital and Private Debt Association). He’s also Deputy Chairman of FeBAF (the Italian Banking, Insurance and Finance Federation) and member of the board of S.p.A, Lunelli S.p.A.. He was Chairman at the University of Trento (from 2003 to 2018), Chairman of Ferrovie dello Stato S.p.A., the Italian state-owned Railways (from 2006 to 2010), Chairman of the daily financial newspaper Il Sole 24 Ore (from 2004 to 2007), of UBS Corporate Finance Italia S.p.A. (from 2002 to 2006) and of the Marzotto Group (from 2000 to 2003). 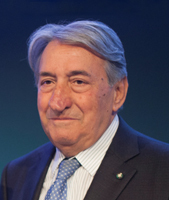 He also held the position of Director General of Confindustria (the Italian Industry Association) from 1990 to 2000. Cipolletta is a component of numerous Scientific Committees. As a professor of economics, he has taught at the University of Rome “La Sapienza”, at the University of Reggio Calabria, at the University of Florence “Cesare Alfieri” and at the Roman University “LUISS–Guido Carli”. Innocenzo Cipolletta is a publicist and economics commentator for Italian newspapers. He is also the author of a large number of scientific publications and books and member of a number of non-profit organisations such as the Italian Statistics Society, the Italian Economists Society, Demographics and Statistics, the ISTAO (Istituto Adriano Olivetti per la Gestione Economica dell’Azienda) and of the Italian Institute for International Affairs (IAI). Innocenzo Cipolletta has been appointed Cavaliere di Gran Croce.